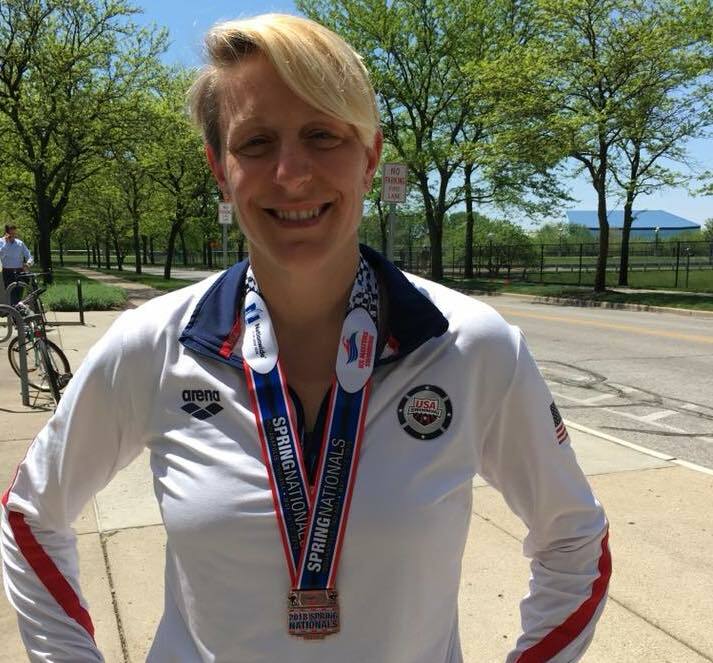 This week, we caught up with Sarah Iepson (@drchoppah), our MySwimPro Ambassador in Oaklyn, New Jersey! 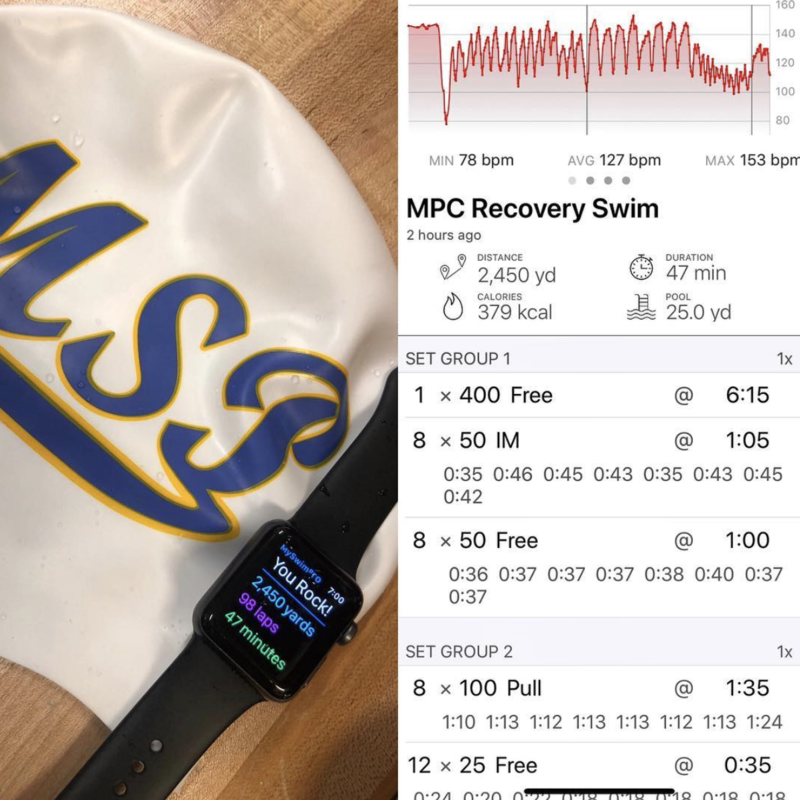 Sarah is an avid masters swimmer and triathlete who loves training with the MySwimPro app! I live just outside of Philadelphia with my husband and gaggle of kitties! 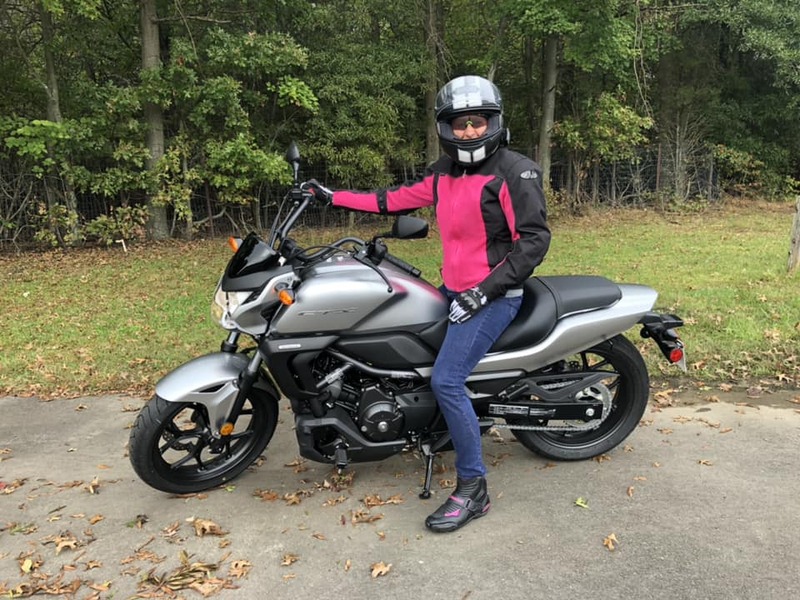 I teach Art History at a local College and love to cook, swim, and ride my motorcycle. I grew up in suburban Detroit, Michigan and began swimming at the age of 6. I was a competitive USA Swimmer up until high school, when I started running cross-country. I returned to the pool as a walk-on athlete my sophomore year in college at Wayne State University in 1998 (GO TARTARS!!). I swam there for three years and am proud of the time I spent in gold and green – swimming the anchor leg of a winning the 800 Free Relay at Conference my senior year was a crowning event for me. I moved out to the Philadelphia area for graduate school and began working on the beach patrol on the Jersey Shore, competing in lifeguard races and eventually getting a bike and starting triathlons. My triathlon life turned into pure cycling when I joined Sturdy Girl Racing team in 2007 and I raced for 10 years, the last 7 at the semi-professional level. After two back surgeries (in 2013 and 2016), I hung up the bike and got back into the pool. I tried to use old college workouts – highly adjusted for being much older and much slower! I also got a workout book from Amazon, but the workouts weren’t really challenging me as I needed. That’s when I found MySwimPro ELITE. It was such a lifesaver! As someone always driven by a team or accountability, I was getting bored in the pool. But, this app made it feel like I was swimming with someone. I’ve been hooked ever since and am thrilled to join the MySwimPro team as an ambassador! I have been following the Workout Of The Day on my Apple Watch as my fresh daily workout, but I also incorporate the Training Plans when I have specific goals I want to reach. It’s really helpful to watch the technique videos on my iPhone, then swim with a guided workout on my Apple Watch. 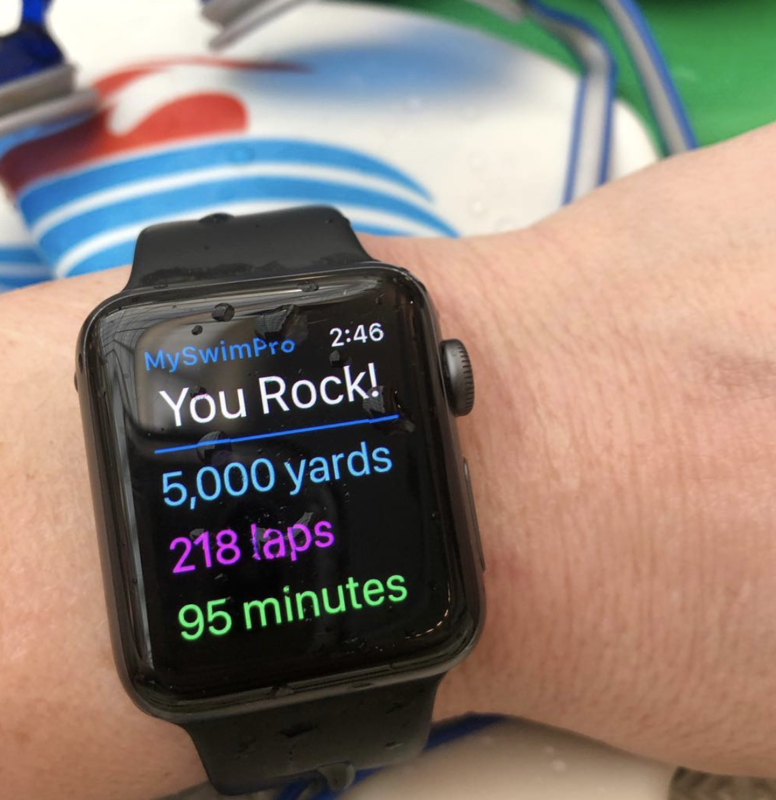 Using MySwimPro was fundamental to my ability to gear up for 2018 U.S. Masters Nationals. It’s priceless for interval training and tracking progress. It helped me better my splits so that I knew what I was capable of doing in race situations. So, it makes it easier to get in the pool and swim – knowing that I’ll get to see the info later! It’s made it easier to workout, made workouts far more exciting and enjoyable, and introduced me to an awesome community of people! For me, the biggest thing with swimming is that it’s a safe way for me to do some good cardio and keep myself active and healthy. Since my back surgeries keep me from doing a lot of high impact cardio, swimming is my key to keeping myself moving! I’d like to swim at Master’s Nationals again and compete now and then, but that’s really just a side goal for me! 1. Stay within yourself! Don’t worry about what others are doing – their times, their distance, their achievements – but focus on your own goals and achievements and be happy with those! 2. Set reasonable goals. Know that you won’t change things overnight, so set reasonable goals that you can meet in steps and stages. This will make things far more fun. 3. Enjoy the ride! If you’re not having fun, you’re doing it wrong! Swimming should be about feeling healthy and happy. If it’s making you miserable or you’re not enjoying yourself, then take a step back and recalibrate! I love shout outs! And, this one is easy! I owe so much to my first coach, Sue. Not only did she believe in me when I was 8 years old and teach me so much all those years ago, but she’s still a part of my life today! She even helped me get outfitted for Master’s Nationals in 2018 with my first tech suit – those things didn’t exist the last time I raced! So, to the coach who nicknamed me Pork all those years ago, thanks!! Oink oink!! 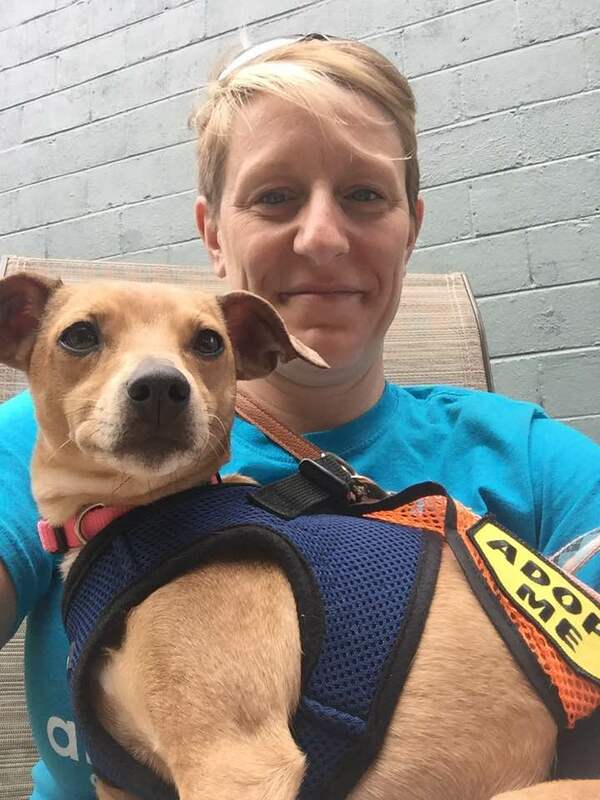 Thank you, Sarah for your support and sharing your story! Good luck on all your races this season!